Made It Through Mum: Celebrate Mother's Day at Dusit Thani Manila : An Ultimate treat for the woman who deserves no less than the best. Celebrate Mother's Day at Dusit Thani Manila : An Ultimate treat for the woman who deserves no less than the best. May is here, and you guys know what that means. Yas, Mother’s Day is almost here. I know, like me, you are thinking of how to spoil your mom this Mother's Day. Your mom is awesome, and you should totally do something cool for her. Flowers, cards, and boxed chocolates are nice, but don’t you think that the woman who spent hours in labor with you deserves something with a little more thought? Fret not! Dusit Thani Manila has got you covered. Dusit Thani Manila offers an ultimate treat for the woman who deserves no less than the best. 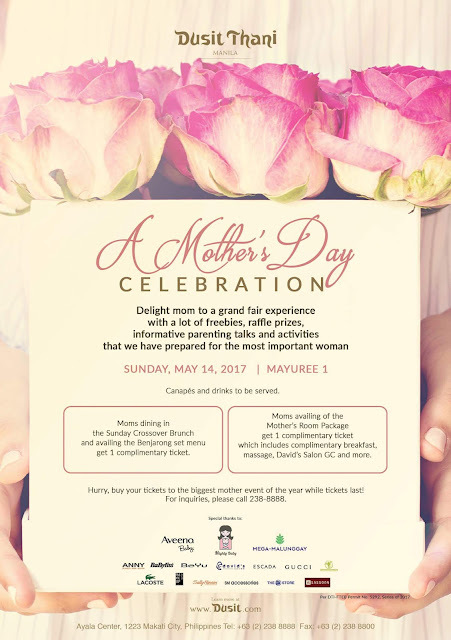 Give back the well-deserved love and appreciation to mom by delighting her to a grand fair experience in A Mother's Day Celebration on May 14, 2017 at Mayuree 1. 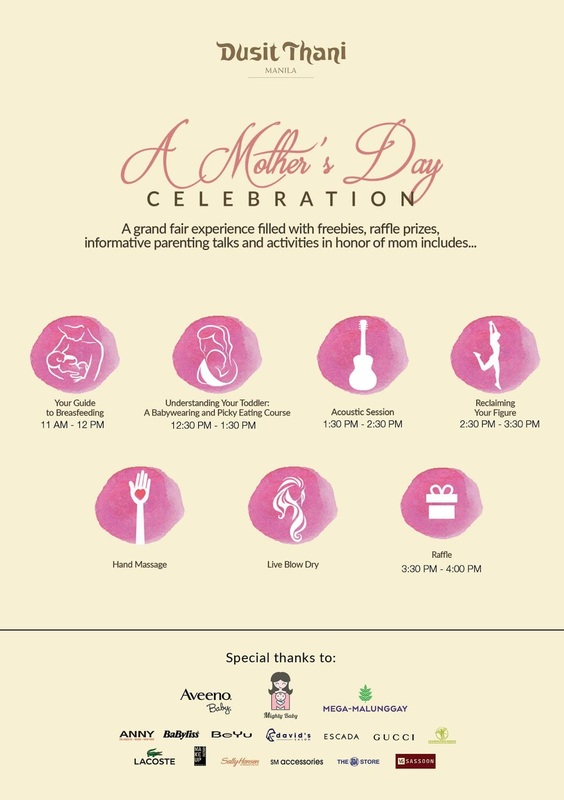 Treat her to the biggest mother event of the year filled with freebies, raffle prizes, informative parenting talks and exciting mom activities she never want to miss! All mothers deserve the best, that's why Dusit Thani partnered with prestige brands to lavish moms such as Aveeno Baby, Mighty Baby, Mega-Malunggay, David's Salon, Belo Essentials, The SM Store, SM Accessories, Babyliss, Lacoste, Hugo Boss, Escada, Gucci and many more. Moms will never go home empty handed as we will be giving away loot bags from our generous sponsors. Canapes and drinks to be served during the program. What better way to spoil the most important woman in your life on her special day than a sumptuous Sunday Crossover Brunch. Enjoy the finest gastronomic varieties at The Pantry and savor authentic Japanese cuisines from UMU for PHP2,500 net inclusive of non-alcoholic beverages and PHP2,950 net inclusive of select alcoholic beverages. Moms dining in on May 14, 2017 get a 1 complimentary ticket to our special Mother's Day Celebration. Or have the option to take your mother out for exquisite dining treat at Benjarong and make her feel the royal treatment with special Thai set menu for 4 persons for PHP4,800 net. It's time to give mom her much needed break by booking a relaxing staycation in one of the well-appointed rooms at Dusit Thani Manila. Room rate starts at PHP6,000 net in a Deluxe room inclusive of complimentary breakfast for 2, complimentary massage, late check-out and David's Salon gift certificate valid from May 13-21,2017. Suite guests are entitled to a 60-minute Devarana Signature Asian Blend Massage per stay. Moms checked-in on May 14, 2017 get a 1 complimentary ticket to our special Mother's Day Celebration. Don’t let Mother’s Day catch you without an excellent gift for your mom. Don't just celebrate moms, pamper them with the best treats she will never forget at Dusit Thani Manila.